Glass of Fancy » 2013 » December - Fashion, fiction, and life in the city. It’s time for our holiday edition of Let’s Lunch! This month’s theme is things that are both edible and decorative, and, wow, doesn’t that cover a lot of ground at this time of year? Maybe I’m biased by my gigantic sweet tooth, but I feel like there’s nothing more decorative than a lovely plate of Christmas cookies and treats. Or at least, it’s decorative for the ten seconds between the time that it comes out of the kitchen and the moment when all that’s left is that weird thing your crazy neighbor brought by yesterday and the painfully overbaked M&M cookies from that batch that was in the oven when your mom called. 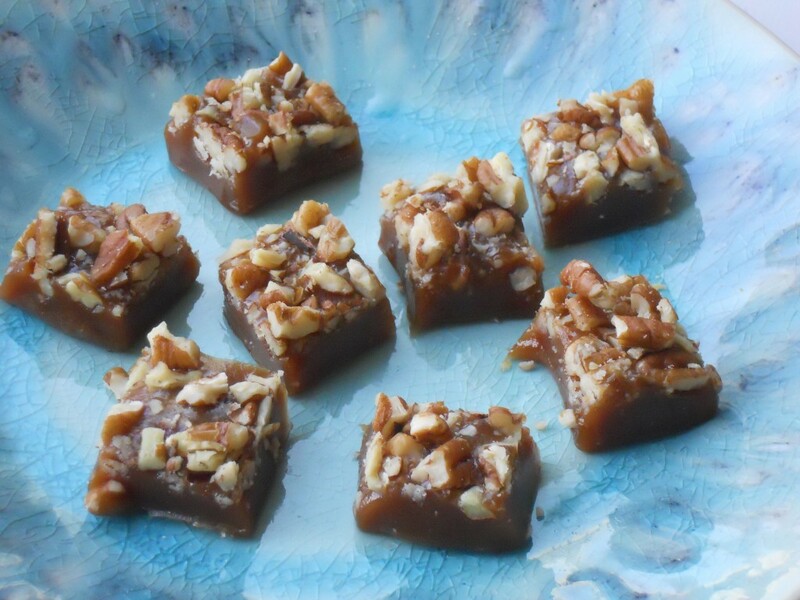 In recent years, I’ve taken to doing caramels as a festive way to greet friends and family at this time of year. I know that may sound intimidating for those who haven’t made candy before, but it is crazy easy if you a) do not ever walk away from the pan, and b) have an accurate candy thermometer. I admit, this last item can be a challenge – I bought two thermometers and found that they sometimes gave me readings as much as 30 degrees apart – but assuming you get a good digital thermometer and pass that hurdle, you’re golden. Because I continue to be obsessed with pecans around the holidays, I put together the little gems above. Recipe after the jump!